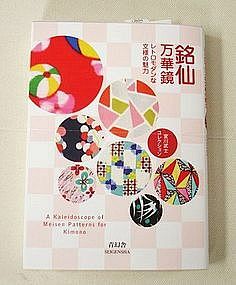 This is a book about meisen kimono design. Mangekyo is kaleidoscope in English and it symbolizes its crisp and dazzling color. It has 220 kimonos with eye-catching and beautiful patterns in full color. Meisen kimono was very popular among young women in Taisho and early Showa Period ( 1920s~1940s ) as a casual kimono. It is a pocket edition and has 255 pages. Only written in Japanese. Author: Miyagawa Takeshi. Publisher: Seigensha. The first edition published: June 6 2009. Shipping to U.S. $6.00 as a printed matter. 11cm x 15cm x 1.3cm 4.3" x 5.9" x 0.5"